Tamirat Tola won the 15th running of this 10km event in 28:44. Bonsa Dida, who had joined Tola on the winning Ethiopian senior men’s team at the IAAF World Cross Country Championships in Guiyang earlier this year, finished second in 28:50. The women’s race was won easily by Mamitu Daska in 32:16. 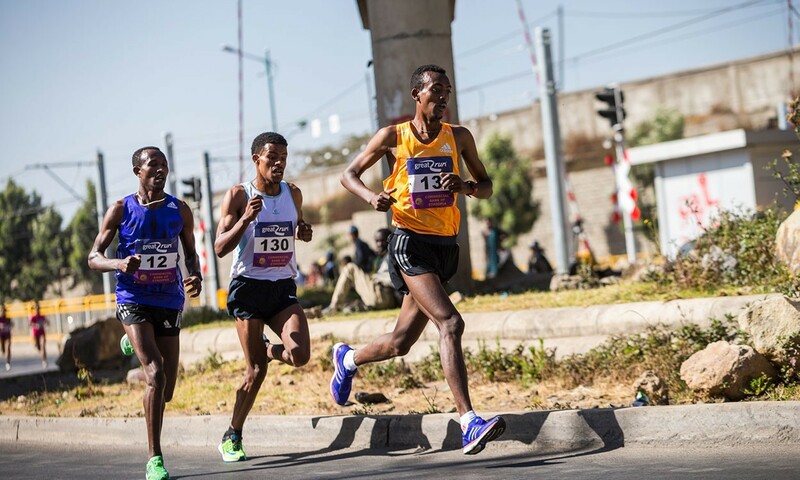 The event, which returned to Meskel Square for the first time in three years, had been billed as Haile Gebrselassie’s farewell race after the long-distance great announced his retirement from competitive running earlier this year. More than 40,000 participants took part in the event, including 14 members of Tyne Bridge Harriers who had won a trip to Ethiopia through the Great Club Challenge. See this week’s AW magazine, out Thursday, for more. Steph Twell pulled off her one of her best victories since returning from her horrific injury in 2011 with a victory in 13:18, eight seconds ahead of Italian Frederica Del Bueno. Kenyan Susan Kipsano Jeptoo was third. The event took place in Hyères, host for next month’s European Cross Country Championships. You can watch a video interview with Twell after her win here. Ben Livesey and Tessa Clarke enjoyed comfortable victories. Clarke won the women’s race by just over a minute and Livesey won the men’s by 49 seconds from Chris Perrin. A fuller report and David Griffiths photographs will appear in this week’s issue. John Franklin had an easy men’s victory while Alex Gounelas dominated the women’s race. London Heathside won both the men and women’s team titles. Alastair Aitken’s report will appear in this week’s magazine. Dan Jenkin was the fastest man from a field of almost 600 with a time of 35:36. Amelia Pettitt was the quickest woman (25:23) from Rosie Smith (25:48) and 1500m specialist Laura Weightman (26:01) as around 400 women took part. Les Venmore’s report and David Hewitson’s photographs will appear in this week’s issue. World youth 3000m finalist Alex Yee continued his good form to have one of his best senior race wins to date as he bettered Phil Wicks and veteran Chris Greenwood. The women’s race was won by Tonbridge’s Lucy Reid from Kent’s Amy Clements who led her team to victory as they also won the men’s team. Martin Duff’s report and Jeremt Hemming’s photographs will appear in this week’s magazine. Alex Hendry won the men’s race and led Central to victory while Edel Mooney won the women’s race as Hunter Bog Trotters won the team event. Kenya’s Edward Cheserek created history when he became the first man to win the event for three successive years as he won in 28:46 from Australia’s Patrick Tiernan who ran 29:12. Marc Scott was the leading Briton in 10th in 30:03. Kenya’s Linet Masai won the women’s 8km race in 28:08. There were senior wins for Maxwell Dumbrell (26:37) and Emma Macready (19:17). Martin Duff’s report will appear in this week’s issue. British and Ireland W50 masters international champion Clare Elms became the 11th runner to win 100 parkruns but the first to reach that mark undefeated when she won by almost four minutes at Clair in Haywards Heath.